Logic. Photo by Chase Smith. Maryland rapper Logic returned to the Kansas City area for the third time in less than two years on Saturday night. His headlining show promoting his latest record, "Everybody," included his usual, highly engaging performance along with a series of skits that kept the crowd laughing during downtime. 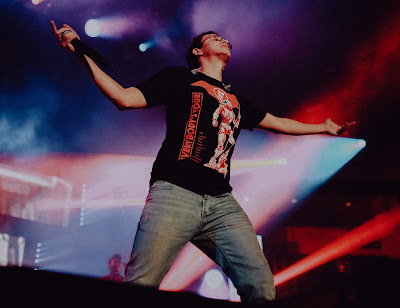 One track on the album details a health scare that Logic believes was linked to his intensive touring schedule of recent years, but a break from performing seems to have done him some good. He was back at 100% on Sunday night. Brooklyn rap hero Joey Bada$$ opened the show by discussing social and political issues in America today. These messages tied directly into the material he performed from his new album "All-Amerikkkan Bada$$."